A co-worker of mine goes down to Philadelphia regularly to see his gf. He asked for a couple tips on where to take her when he’s down there. Below is an edited version. I’m heading down there in a couple weeks, so I’m going through it as a refresher. Getting around: Not sure how much you are going to see the town, but keep it for future reference. The lay of the land is this: Market bisects downtown going east to west, Broad splits it going north to south. 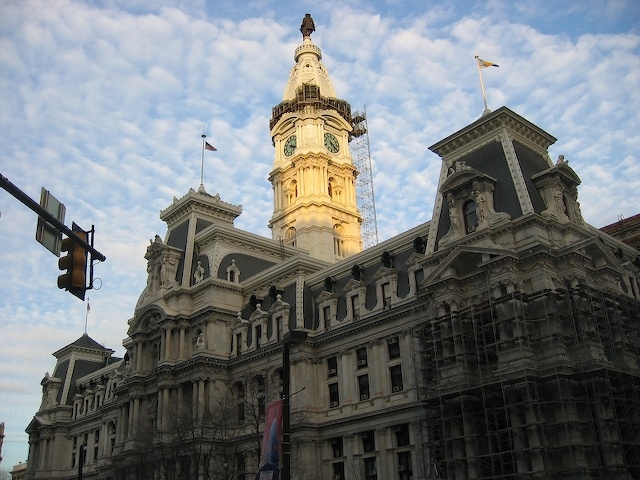 City Hall is right in the intersection of Market and Broad. Streets on one side of Market are marked North and on the other side are marked South. Not sure if the numbers change like they do in NYC. Broad is 14th St, so the streets go up 12th, 13th, Broad, 15th and so on. That area is generally known as Center City, the Convention Center is there and a low end shopping district is there too. Market, Chestnut and Walnut east of Broad for a couple blocks looks a lot like Fulton Street or Jamaica Ave. The transit there is called The SEPTA, short for South Eastern Pennsylvania Transportation Authority. I only know that because Black Thought referenced it in a Roots track years ago. It’s pretty straightforward. There are only a few lines in the system, so if you get New York, you’ll have no problem figuring it out. The Blue line goes up and down Market (it also heads up to Northern Liberties, but I’ll get to that later). This may be your best bet to get around. It’s probably what you will take from the bus station to where you are staying and it has a stop right by a bunch of the places I mention below. Rittenhouse Square is west of Broad and south of Market. The area is pretty swank and so Tammi and her friend went shopping, leaving the guys to find a bar and wait them out. There are some fancy restaurants out here and at least one beer bar, the name of which I can’t recall. I plan to check out this area a little more next time I go. Old City, around the area where a lot of the places I’m mentioning are, is obviously the oldest area of town. It has gorgeous old houses and makes for a nice walk during the day. After hours it gets pretty full and there’s a 4 to 5 block section that’s pretty much all bars and clubs. That’s Market and Chestnut between 2nd and 4th. I usually stay at the Hyatt on the waterfront a couple blocks away from there. South Street is the college strip. There are a bunch of restaurants, funky shops and bars from the river all the way up to 10th street or so. My favorite cheesesteak place is on South around 4th or 5th, it’s called Jim’s. The line is often out the door and around the corner. Up in Northern Liberties, you’ve got two Bar/Restaurant places, sort of like Gastropubs in the UK. I checked these two out when I was there in January after hearing about them. I liked them both a lot. The vibe from both of them was very laid-back and creative. The neighborhood is a sort of up and coming arts district. Real Estate folks are all over it dropping down condos and fancy buildings, but, at least for now, the artsy types who started it all up are still in the neighborhood. I don’t know Chinatown well, but I saw the Roots perform at the Trocadero, a long time ago. It’s around where the Bus Station is. There are some really cool places to go down in Philly. These are all places I’d go to again. This is a great Tapas place on Chestnut between 2nd and 3rd. Real Spanish tapas, not the small plate stuff you find everywhere these days. I can’t remember any of the particular dishes to recommend, but we ate well. From what I recall it was a little on the pricey side, but since it’s small plates you can moderate it a bit, especially if you go for a snack. 2nd Street between Market and Chestnut. I’ve been here a few times. My mom loved it. You get a real scene here on Friday night in this whole area, so it can get a bit crowded and loud. It’s not the place for a quiet conversation, but the food is good. The prices are pretty moderate here, you won’t blow your budget. It’s also right around the corner from a bunch of other places to chill, listen to music or dance. I love this place. It’s also Cuban and has a somewhat similar decor, but it’s higher end. It’s near swanky Rittenhouse Square, so the prices are higher and the food is fancier than Cuba Libre. It’s definitely worth it for a nice night out. I took my sister here for her birthday a couple years ago. The larger of the two is a huge old building with a patio upstairs and 2 or 3 dining spaces. It’s got brunch on the weekends, which is the perfect way to spend a Sunday afternoon to me. I want to make it down before it gets cold just so I can chill with the paper or whatever on their patio for a few hours. North 3rd is similar just in that it’s really interestingly decorated and serves good food. They also do brunch. We were there a few weeks before the superbowl so the game was on, which you’d never see in a place with a similar crowd in NYC. One thing about philly is that even the hipsters love their sports. On the low end of the spectrum, there are the famous philly sandwiches. Everyone knows about the cheesesteak, Philly’s gift to the world. The Roast Pork Sandwich is it’s best kept secret. It’s incredible. The Roast Pork Italian is made up of beautiful, moist slices of roast pork, topped with provolone cheese and broccoli rabe. I usually don’t like the bitter flavor of broccoli rabe, but it’s perfect in combination with the rest. 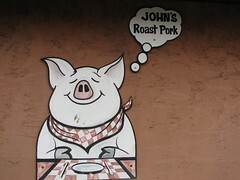 Last time I tried to go to John’s Roast Pork, but they were closed. Instead, we ended up going to Tony Luke’s. It was amazing. Sadly, neither is particularly accessible if you don’t have a car. Philadelphia Magazine made a top 10 list of the best Roast Pork sandwiches in and around the city. On their recommendation, I intend to make DiNic’s in Reading Terminal Market one of my first stops when I go there next. I’m not one for clubs, I tend toward places where I can chill with a drink and listen to some good music or talk with friends and such. Standard Tap and North Third are both good places to go for a drink, but they are a bit out of the way. The Five Spot is down in Old City. It’s got 2 floors with live performances upstairs and the DJ Lounge area downstairs. They regularly play Hip-hop and Reggae. My sister had a good old time on her 21st Bday last year. Filo’s (408 S 2nd St off South) is a dive. There’s no way around it. But it’s a dive that plays some pretty good music. Or at least it did last time I was there. I wouldn’t go out of your way to go, it’s definitely not a romantic spot, but it’s worth stopping in. Just for fun, I like to get a drink or two in the lobby bar at the Ritz-Carlton. It is on Broad and Chestnut I think. It’s a gorgeous old bank lobby with super high ceilings. The drinks are of course a bit expensive, but not ridiculous. And you can’t beat the ambiance. Le Bec Fin is supposed to be the best restaurant in Philly. I don’t know one way or the other, but my friends and I chilled at the bar downstairs and it was fun. It was swanky and subdued with a good drink selection.